(*Writers note*) Let me get this out of the way now; I spent several hours being bombarded by Mike Elgin zealots, all because I ignored a link of possible troll account. During the course of the drama, some interesting news came out about Elgin that damages his credibility and ability to trust his words. That won’t be involved in tonight’s posting as the whole situation worked me up, and I want to express the findings in as calm as a manner as possible. With that said, to the news. 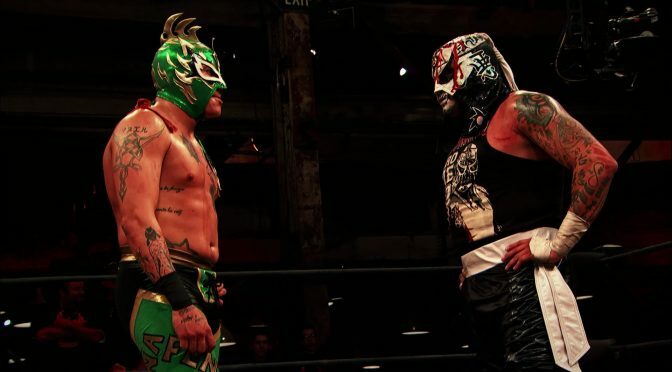 For Rey Fenix, last night was a scary encounter. During a match at AAW in Austin, Texas, Fenix hit a cutter on after a back-flip on Myron Reed. Fenix landed awkwardly, possibly hitting heads with Reed and didn’t get up. The match was quickly finished by Pentagon and Fenix was taken to the hospital. There is conflicting reports as to what Fenix suffered. Mike Johnson claims the report of a stinger are untrue, and claims he was diagnosed formally with a ‘muscle contusion’. Stingers are a informal name for what happens to a nerve when it’s pinched or pulled. The point of contention appears to be over whether it was the muscle or the nerve that was adversely affected. Either way, Fenix will be out for a few weeks and no word on if this will affect any future bookings. One of which is for IMPACT Wrestling, who announced last night that Fenix and his brother Pentagon would take on Rob Van Dam and Sabu at the United We Stand event on April 4th. When All Elite Wrestling announced that they would be partnering with AAA, fans were curious to what the standing with AAA and IMPACT Wrestling is. Well, Mike Johnson again has the answer; AAA will work with both. Johnson writes that IMPACT knew of the relationship prior to the announcement, showing that the sides are working together amicably without trying to upset one another. Quick Hits – WWE’s Ronnie Arnell (Tye Dilinger) announced he returned to the road tonight, but also that he had wanted to go back to NXT but couldn’t. PWInsider reports that the WWE is going to be working with Netflix to publish the WWE’s films. Lastly – Just a bit of promotion, Chikara is hosting their annual National Pro Wrestling Day event, at Tellus360, 24 Eats king Street in Lancaster, Pennsylvania. The announced matches include Kimber Lee and Whisper taking on Crummels and Defarge. Penelope Ford taking on Still Life. Leary and Babish taking on Merlok and Oceanea. Officer Barksdale taking on Hallowicked. An eight man tag featuring Los Ice Creams and Proteus Wheel taking on Bird and the Bee and the Colony. As well as Xyberhawx 2000 taking on F.I.S.T. and Missle Assault Man taking on Juan Francisco de Coronado. The event is free to attend, though they ask that you provide a minimum of ten dollars to support the Arch Street Center, a mental illness support group. Previous PostSteiner Family Four – Oh, Hi! Oh, Guys…PodcastNext PostAMC Cancels Cult Hit and More Nerd News!